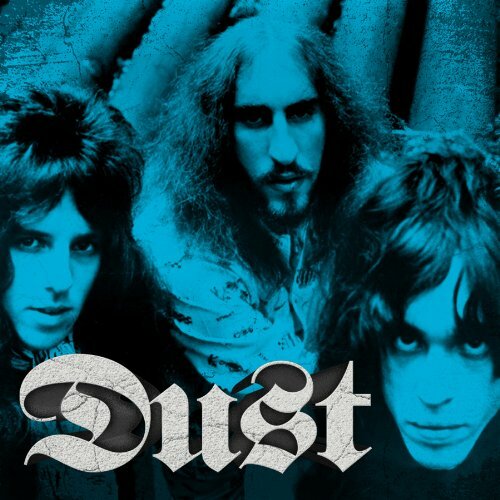 Even in the time before Twitter, information could fly like mad bees through high school hallways and such was the case in the early 1970’s when friends started buzzing about a band called Dust. Unquestionably local heroes here in Brooklyn, everyone seemed to know a relative or close friend of one of the members, and that sixth degree of separation from a signed act was an inspiration for an upstart guitarist like myself. Seeing the skulls staring from the cover of their first, self-titled, LP on the racks at Jaime’s Record Store on Flatbush Avenue made the rumors reality. The following year Hard Attack, adorned with Frank Frazetta’s Frost Giants painting, made an even bigger impression. Was their ever an album that better represented its title? Truth is I owned neither of these albums in their time. You didn’t need to buy them to hear them regularly. In the days of communal listening everyone had a personal stash of records they brought along when visiting friends. At gatherings I was responsible for supplying Black Sabbath’s first, the Who’s Live At Leeds and Screaming Lord Sutch and His Heavy Friends, among others. 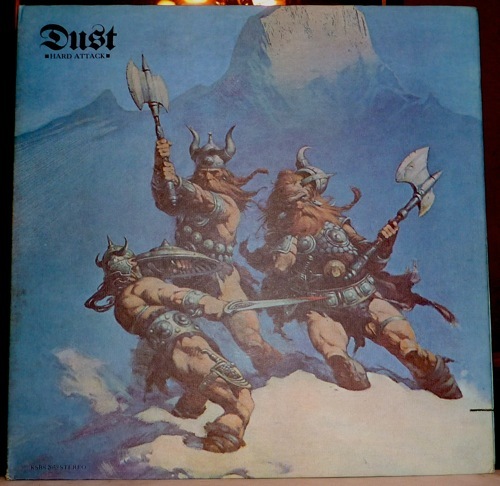 I did add both Dust albums to my collection a few years later, when they turned up in the “cut-out” bins at Titus Oaks (also on Flatbush Ave). While most pre-press for the CD points to Dust as progenitors of American metal, (a title I’d personally ascribe to Blue Cheer) that spin actually short sheets the bands talents. They were in fact children of their times, likely listening to friends’ record collections, and being influenced by a wide variety of styles. Across the 17 song disc you’ll get flavorings of Cream, Mountain, The Who, and even Beggar’s Banquet/Let It Bleed era Rolling Stones. That said, the dirge-like “From A Dry Camel” with its extended eastern modal jamming, the instro “Ivory” and the heavy riffing and extended bass guitar solo of “Suicide”, will not disappoint fans of early Black Sabbath. In this classic power trio line-up Kenny Aaronson’s bass playing at once approximated the styles of both John Entwistle and Jack Bruce, and like them his melodic counterpoint drives many of the tunes. He also peppered the mix with dobro slide and touches of pedal steel guitar ala Led Zeppelin 1. Like early Zep records Richie Wise’s acoustic guitars are used to add texture intermingled with the electric rhythm and lead tracks. Marc Bell’s powerhouse double bass drum tracks are an excellent primer for current 70’s centric skin bashers. My Vintage Copy of Dust’s Hard Attack. Note “Cut-Out” in Lower Right Corner. I’m extremely happy to have these recordings updated respectfully and available to new listeners, not just bin pickers. The enjoyability of these songs goes deeper than their artifact value. To their credit the band has done an exceptional remastering job. The CD compares quite favorably with the original vinyl pressings adding extra depth and detail without compressing the sonics for the sake of loudification. Don’t expect arena rock production here. These tracks are from the days before everything became bathe in an ocean of ambiance and it’s refreshing to hear their tight, nearly dry, staging. The remaster reveals more space around the vocal reverb, crispness in the acoustic strums, grit in the electrics, and an all around enhancement of the bass sound, accentuating its gutteral low end. A vinyl version of this release will be available on April 20, 2013 – i.e. Record Store Day. Based on the striking graphics of the original Kama Sutra LP’s, the CD cover art is a bit disappointing but the booklet is loaded with each band member and producer Kenny Kerner getting their say. The albums have been chronologically flopped for some inexplicable reason and it’s certainly a missed opportunity not to have included at least one live tune from the band’s heyday. Though Dust dissolved in late 1972 the members did not go gentle into the good night. Marc Bell became world famous as Marky Ramone, and Richie Wise (along with Kenny Kerner) produced the first two albums for a little NY band called KISS. Kenny Aaronson continues to rock the low end and I had the pleasure of hearing him do just that at the Eagle Vision’s Rory Gallagher Tribute a while back.